﻿After a long break for a harness racing book (The Best There Ever Was: Dan Patch and the Dawn of the American Century) I'm back to my other favorite topic. The Connecticut house of one of the state's Civil War heroes is threatened. First, here's the essay I wrote about him as part of the effort to save the house. There was no better-known public figure in Connecticut during the last half of the 19th century than Joseph R. Hawley, crusading abolitionist newspaper editor, Civil War brevet Major General, Connecticut governor, congressman, and U.S. Senator. Ironically, this ardent anti-slavery crusader was born in North Carolina, the son of a Connecticut-born minister who had been hired by a congregation in that slave-holding state. The family returned to Connecticut when Hawley was eleven, but he was old enough to bring with him an abiding hatred of slavery. Hawley trained to be an attorney and briefly practiced law, but he turned to politics at the age of 25, becoming an active member of the Free Soil party, an organization whose aim was to prevent the spread of slavery to the new states of the west. In 1852 Hawley became the editor of the Charter Oak, an abolitionist newspaper published in Hartford. It was not as well-known as William Lloyd Garrison’s Liberator, published in Boston, but it was still widely reviled in the South. In 1857 the Charter Oak was folded into the Hartford Evening Press, a more conventional newspaper created by Gideon Welles, soon to become Abraham Lincoln’s Secretary of the Navy. Hawley became editor of the Press, which was still enthusiasticallt abolitionist. The Connecticut branch of the new Republican Party was organized in Hawley’s office in 1856 and in 1860, when Lincoln was testing the waters for a possible presidential run, Hawley asked the Illinois lawyer to visit Hartford and helped organize Lincoln’s speaking tour that year. 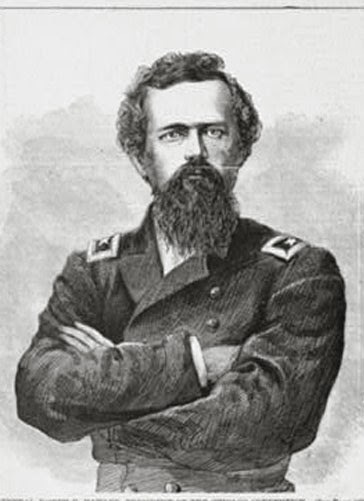 The day after the fall of Ft. Sumter, when the newly elected Lincoln asked for troops, Joseph Hawley became one of the first New England men to volunteer. He joined the First Connecticut Infantry, one of the few Union regiments that performed well at the first battle of Bull Run, a fiasco for the North. He then joined the 7th Connecticut, which was sent south to take part in the recovery of the Atlantic coast forts that had fallen to the Confederacy during the early months of the war. Hawley rose to Brigadier General and eventually to Major General as the 7th was involved in the recovery of Fort Pulaski, James Island, Fort Wagner, and Fort Fisher, He also saw action at Olustee in Florida and the battles surrounding the siege of Petersburg. During the last months of the war, General Hawley was military governor of North Carolina. For several months after Appomattox, Hawley served as second-in-command to General Alfred Terry of New Haven, military governor of Virginia. A few months after mustering out in January of 1866, Joseph Hawley was elected governor of Connecticut. He failed in his reelection bid, mostly because of his uncompromising stance on full civil liberties for freed slaves. He returned to newspapers, where he supervised the consolidation of the Press and the Hartford Courant, becoming editor of the new Courant. But he left that job to run for Congress, serving three terms. In 1881 he was elected to the U.S. Senate, serving 24 years. Immediately after the war Hawley’s primary home was in the Nook Farm section of Hartford, where he was a neighbor of Mark Twain and Harriet Beecher Stowe (Hawley’s wife was Stowe’s cousin). In the 1890’s Hawley purchased a cottage in the Woodmont section of Milford, and eventually that cottage became his sole Connecticut residence. In the winters he lived in Washington D.C. where he attended to his senatorial duties. Hawley became famous throughout the state for his appearances at monument dedications, ceremonies honoring Civil War veterans, and other public events, Even as his health failed late in his life he made an effort to speak wherever he was asked, although he often needed help to walk to the podium. Hawley died in 1905 of heart disease and the lingering effects of the malaria he contracted during the war. His death was front page news around the country and he lay in state in the U.S. Capitol. Now, about the house. His final house has been purchased by someone who wants to demolish it. 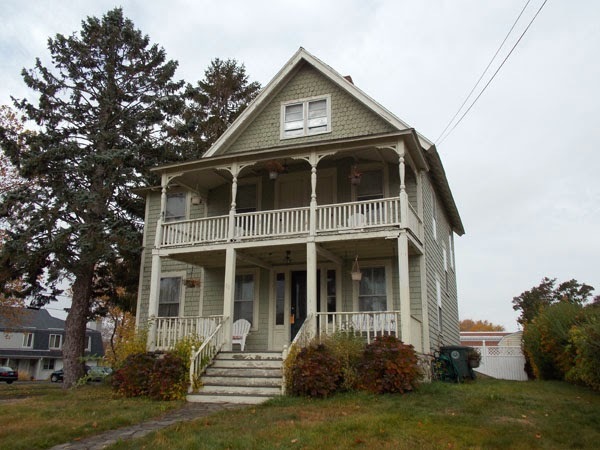 It hasn't happened yet, but only because Milford, Connecicut's city historian has imposed a 90 day demolition delay which can be used to allow a little time to change minds or explore other options for historic houses. Unfortunately, the buyer wants the location: on a hill a block from Long Island Sound that was not touched by Superstorm Sandy. It's an attractive small Victorian cottage, with the operative words being "small" and "cottage." Although it's in decent shape, it's not what people today seem to want. It's not protected and will probably go. It will be a sad day when it does.